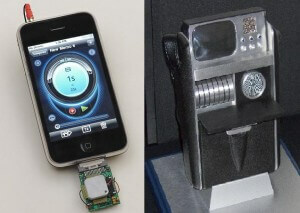 NASA developed a chemical detector that plugs into an iPhone (left). It already looks more hi-tech than a tricorder from Star Trek (right). A researcher at the NASA Ames Center has developed a proof of concept device which can convert an iPhone into a chemical sensor capable of detecting ammonia, chlorine gas, and methane. The chem sniffing device is a small silicon chip (no bigger than a stamp) that plugs into the phone. Upon detection, the chip uses the phone to alert others. It was developed as part of Homeland Security’s Cell-All program. The US hopes that one day a small, inexpensive, and portable chip such as this one could be used to turn thousands (or millions) of mobile phones into a means of quickly detecting hazardous chemicals in public environments. That detection could save lives and help direct first response units. Of course, for the nerds out there the device’s true importance is easy to see: it’s the next step to developing a tricorder from Star Trek. For those of you who don’t regularly attend conventions wearing pointy ears, a tricorder is a fictional device from the Star Trek universe. It’s the go-to scientific field instrument that identifies…well pretty much anything – alien life forms, rare minerals, the composition of the air. Your tricorder probes and samples its environment and tells you what’s around you. The NASA device does the same thing, albeit for a much smaller set of substances. Still, it’s the first of many steps to developing a handheld device that can measure the world in a scientific way. Right now, Homeland Security has plans to use the chem sniffer in an anti-terrorist detection program (more below) but one day we could see advanced versions helping us measure air quality, determine UV exposure, or tell us if there’s any dairy, nuts, or gluten in our meals. The tricorder would put scientific examination in the palm of our hands. Currently, the device is only able to detect a limited range of gases using a 64 nanosensor array (16 on each side of the chip). The range of gases it can identify will likely expand and be refined as nanosensors are developed for new substances. A small “sampling jet” collects air from the environment and directs it onto the array. 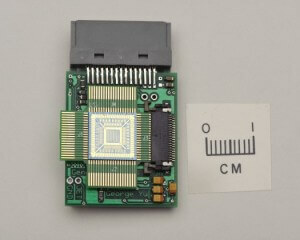 The multiple channel silicon chip also knows how to use the mobile phone to connect, via WiFi or Telecomm, to other phones or a central hub to alert them in case of detection. That’s a nifty piece of engineering, and something we didn’t really see in Star Trek. The connectivity of detection devices is going to affect the way we use chem sniffers long before they become as complex as tricorders. It's less than one square centimeter now, and could get much smaller. The chip once miniaturized and adapted could be fit to work in a wide range of mobile devices besides the iPhone. While the current device fits outside the iPhone housing, future devices could be included within the phone itself, using the sampling jet to gather outside air. Imagine having such a chip in every phone. Your mobile could warn you if it detected one of the bad gases in your area. In fact, if everyone had such a chip in their phone, any chemical dangers in the country could be identified almost instantaneously. Which is the point of the $3 million Cell-All program: crowd-sourced detection. Crowd-sourcing, the distribution of a task among a large group of people, is a concept most often associated with civil disobedience, elaborate pranks, or community service. Yet as Wikipedia has demonstrated, there is great power to be had even in the unprofessional work of millions. In the wake of the 1995 sarin gas attack in the Japanese rail system, officials were criticized for the long delays it took to identify the chemical used. Homeland Security hopes that the Cell-All program will eventually be able to provide an early detection system that could help undermine such an attack in the US. While it’s unlikely that we’ll see an ammonia, methane, or chlorine gas attack, the chem sniffer may one day be able to detect the more likely offenders (sarin, anthrax, etc). I wonder if similar sensors and alert systems could be used for biological pathogens. We’ve seen a silicon based bacteria biosensor that could be adapted. Likewise with lung cancer. Crowd-sourcing, if the privacy issues are dealt with, could help us drastically improve our healthcare system by providing round the clock monitoring of public health. Our primitive tricorders could become not just mobile scientists, but mobile doctors as well.